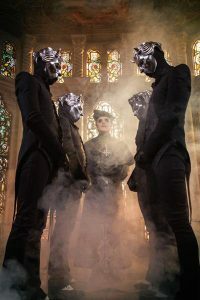 Ghost may not have walked away from last night’s GRAMMY Awards with a statue to pair its 2016 “Best Metal Performance” GRAMMY with, but the band did wake up this morning to find that it had grabbed the Gold Ring as “Dance Macabre,” the current single from the “Best Rock Album” contender Prequelle, became the album’s second consecutive track to hit #1 on the Active Rock Radio chart. The album’s first single “Rats” (nominated last night as “Best Rock Song”), held the #1 spot at Rock Radio for an unprecedented eight straight weeks, setting a record for 2018. Having taken a short break from Ghost’s current European headline tour to attend the GRAMMYS, Forge travels this week to Stuttgart, Germany to rejoin the Ghouls on the road. Starting in May, Ghost will be Special Guest on Metallica’s 25-date “WorldWired” European Stadium Tour.